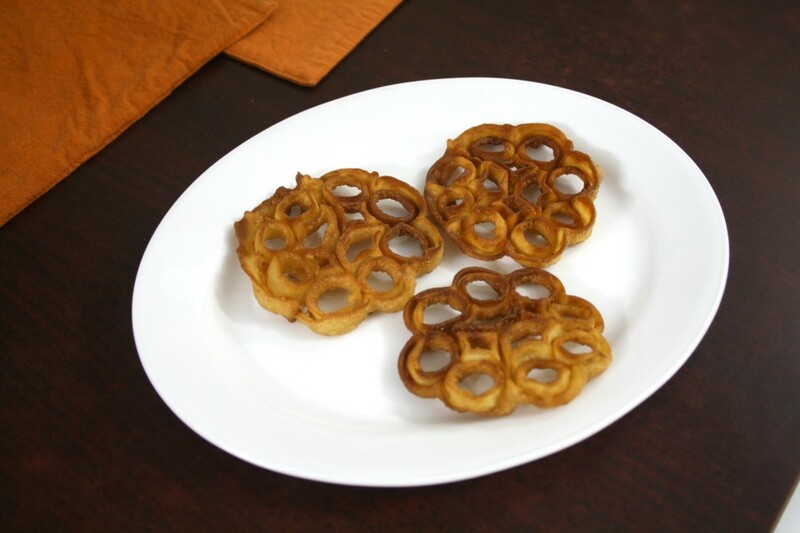 When I think of those delicately woven, crispy, not so overly sweet, yet sweet enough to make you want more, a special snack called the Achu muruku or the Rose Cookies. I was about ten years then, when I first saw this being done. You can imagine the impression this had, if I can still remember that day so vividly, even to the last minute detail on how my neighbour was making it. Something in the way it looked, made me realise that I would love this snack. Then many years passed, Amma never attempted to make it herself. I remember this being one of those snacks we buy from store. But then again not so often as we tend to forget about it. The only time this gets back to memory would be during the Christmas time, when our Christian neighbours would be making it for Christmas. Though this is pretty much made by all Hindus, I am not sure why it’s so associated with Christmas. Including few other snacks. So when I decided to do some special snacks that get done during this time, I had to make this. And wanted to rest my deep wanting I had, on making this since a long time. Amma told me that she had the achu and we decided we would make it. About couple of weeks back to be precise, I told her that I am all set to make it. 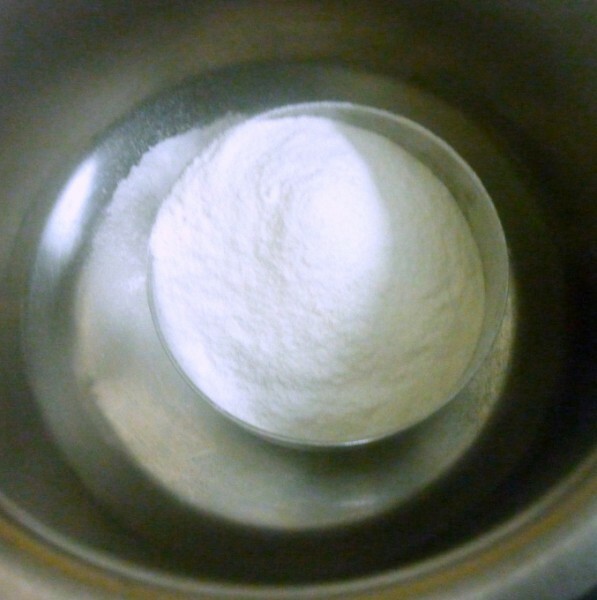 Since this mostly involves using egg, I wanted to make sure I have the eggless recipe on hand. And one fine evening I set out to make it. I must confess, though not wanting to sound very pompous, that this is the first recipe that we failed miserable It was a lesson learnt. Nothing comes as easy as we think, we have to slog and spend time making it right. So for a week long, I actually washed, cleaned, oiled and again washed, cleaned and oiled. A process that I went on doing it for a week long, hoping fervently that my ardent wish would come true. On the day of the battle, I was all set and ready. Amma cautioned that I might want to reduce the quantity. I wish I didn’t! Anyway, when I sent out to make it, it again looked like a loosing battle. 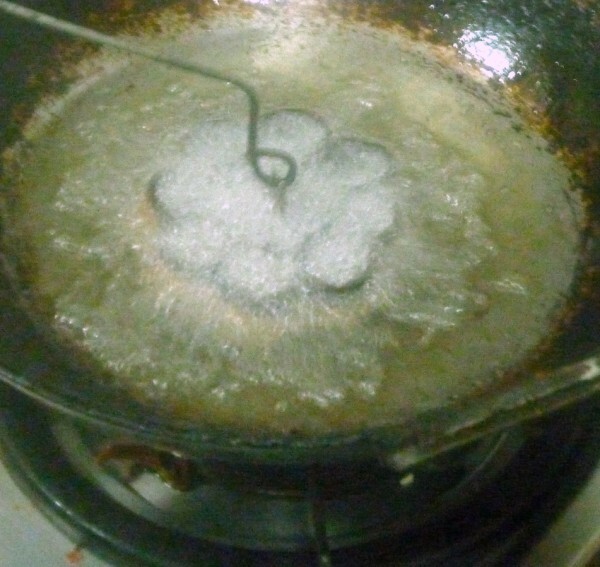 The batter was having it’s own mind, when out of frustration or some inspiration, I let the Achu endure more torture in the smoking oil. And lo, the imprints were perfect! I finally understood the trick and what followed was a sweet success. As I said I wished I had made the whole lot than reducing it. I was happy seeing my kids munching on those and wanting more. Now that I have befriended my beloved Achu, I know it won’t let me know. 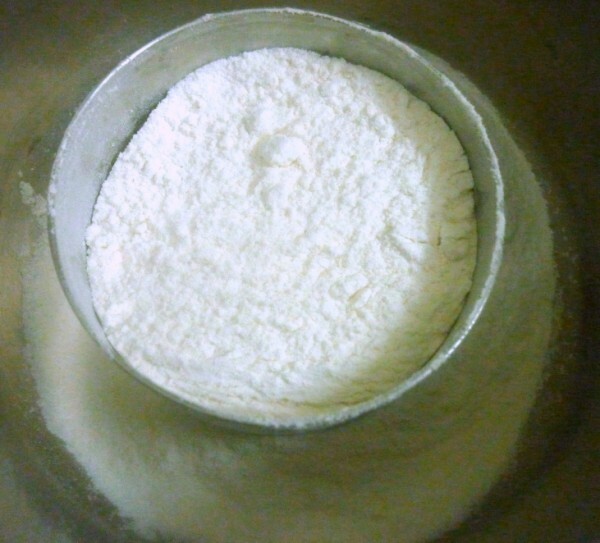 In a bowl, take all ingredients together and slowly add in milk, to form a batter of pouring consistancy (a little thinner than Dosa batter), and let it stand for 10 minutes. 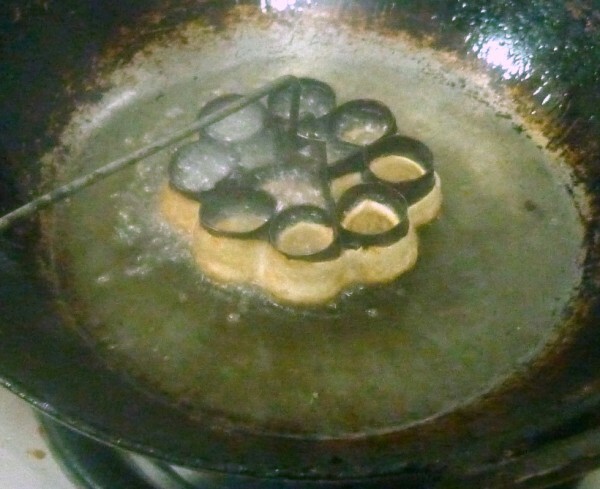 Keep the Rose Cookie mould immersed in oil as the oil is getting heated. At this stage the temperature should be high and the mould should be sizzling hot. 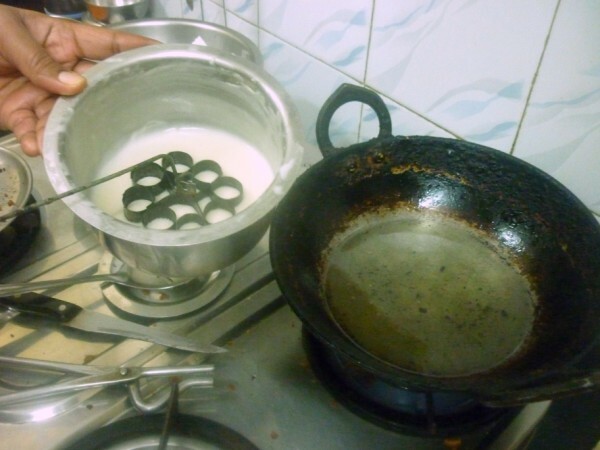 When the oil is hot enough (the batter should rise as soon as it touches the oil), dip the hot cookie mould in the batter only half way through, so that the batter clings half way to it. 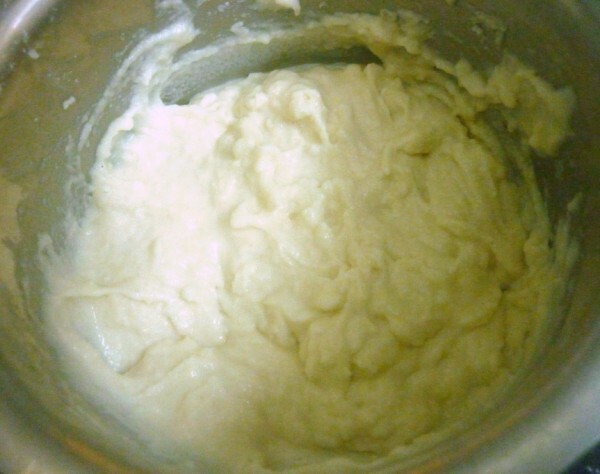 Dip the mould with batter into the oil and after a minute slightly shake the mould holding the handle firmly. If he batter is not getting removed, use a knife to shake it out. 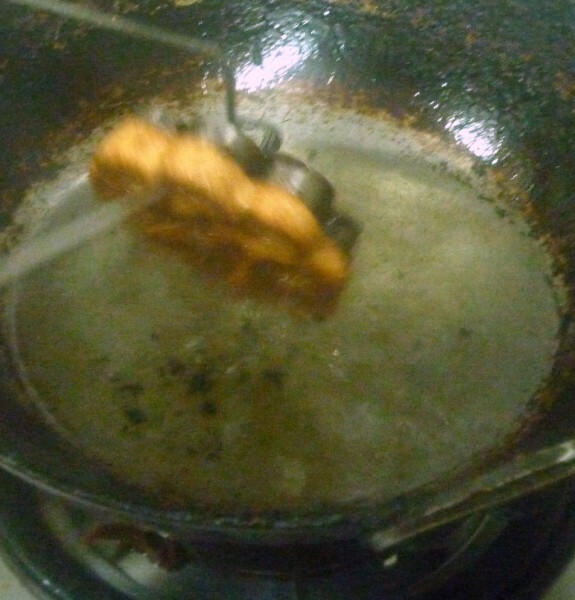 The half cooked cookie will slide into the oil. 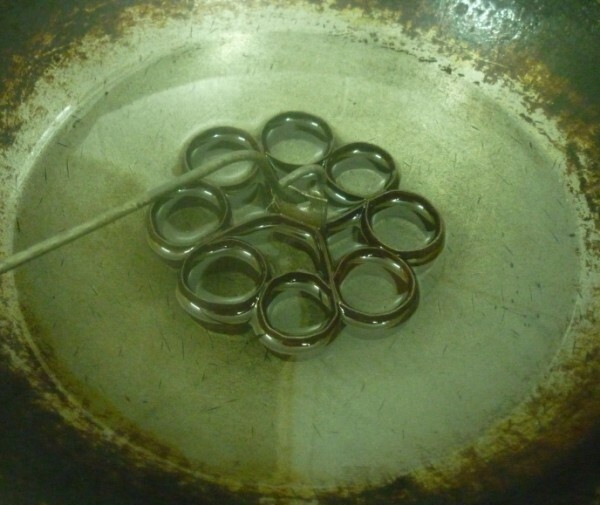 You can also use a fork or a slender knife to ease it out into the oil. Flip the cookie using a perforated ladle and cook until done. 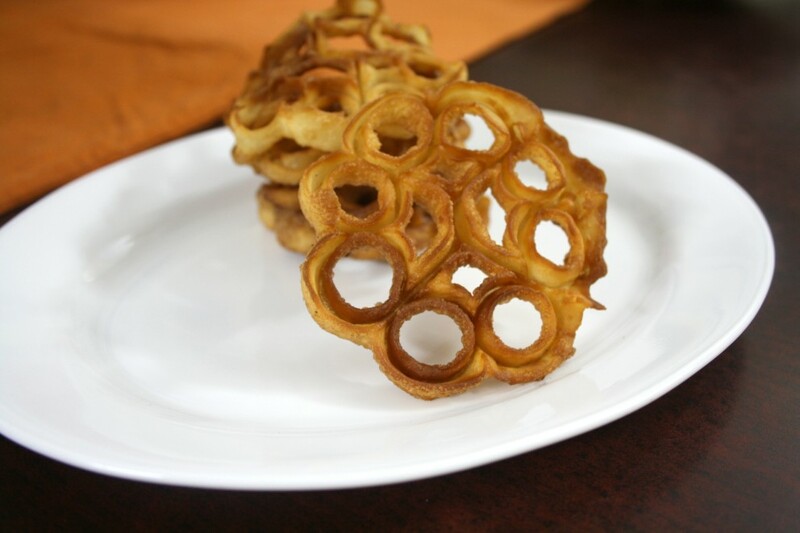 Remove the rose cookie from oil and drain on a paper towel. 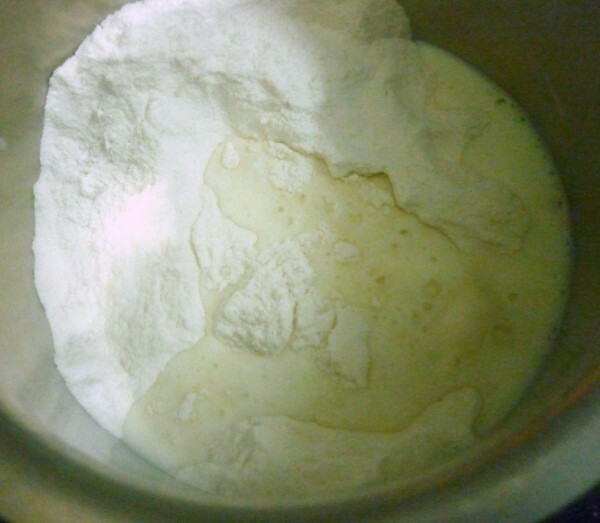 The batter should rest for at least 10 mins. 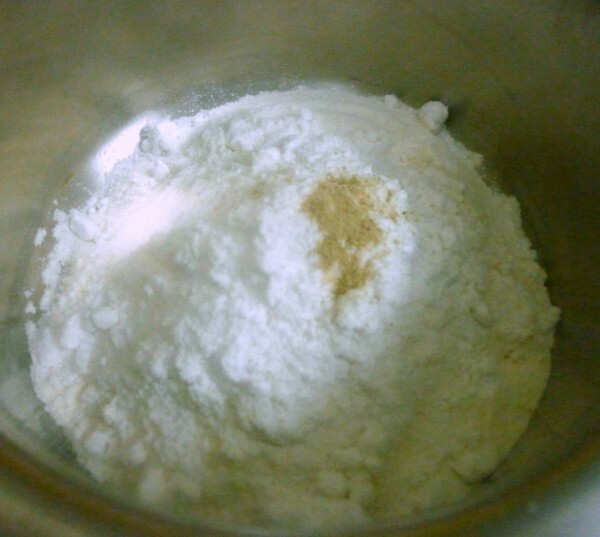 Make sure the mould is seasoned well by being washed and oiled several times before actual use. I almost did everyday for a week. 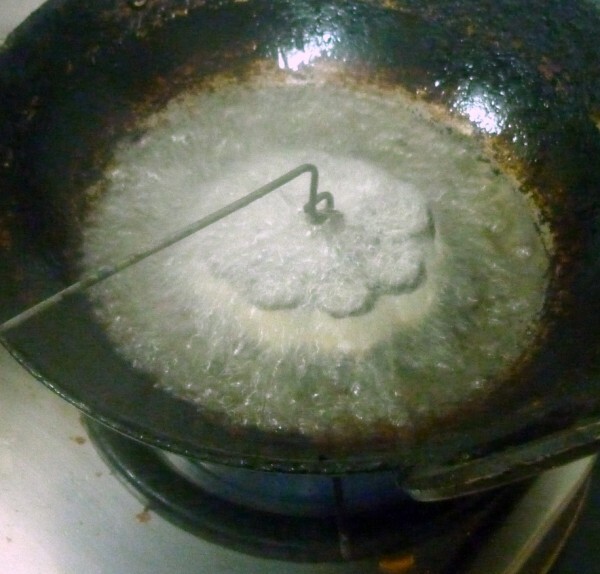 The hot should be hot and the mould also be equally hot when you plunge into the batter. Make sure the batter is in a long vessel when you dip the mould. 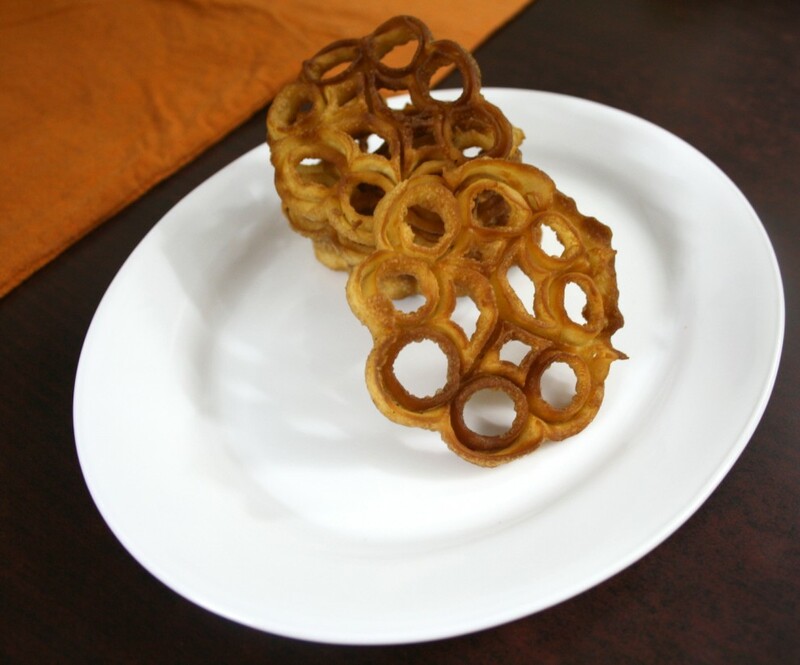 This snack is a slightly difficult task until you get a hang of it. My mom used to make this at every Christmas.this bring back so many happy memory. thanks. Just love munching this cookies, am planning to make some with eggs soon. Wow!!! 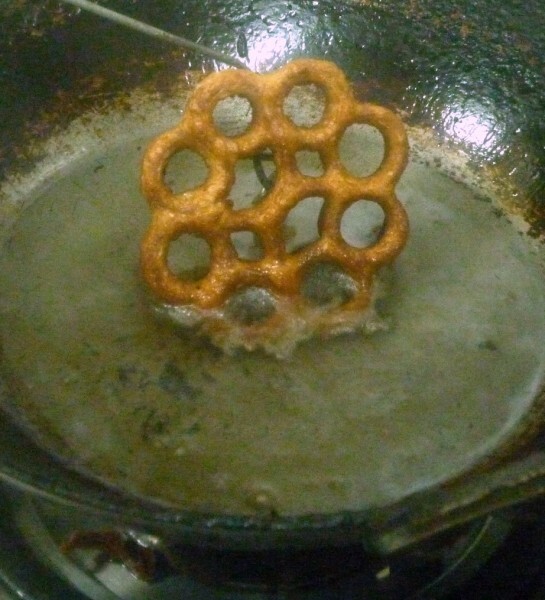 !perfectly made,looks crispy and yummy…..
Am bookmarking this authentic and very difficult murukku!!! I still do not have the press / achchu!!! a very detailed explanation is so very helpful.. thanks valli!! while on a holiday to south I did see this…but did not try it..looks lovely. Sounds delicious. I got to see this only on blogs. I have never seen anyone in our families making it. MIL used to make these long ago.It is one of my favs. Got the achu at home but never tried it myself!